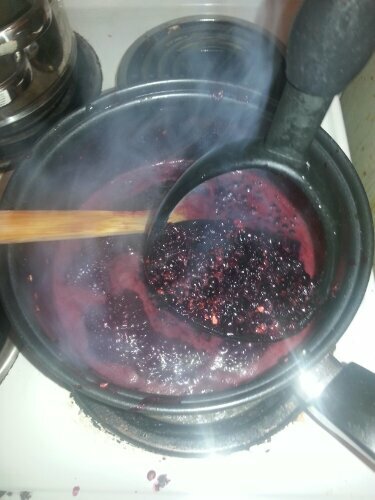 What was intended as a simple Elderberry syrup for the winter ahead turned into something I can’t get enough of. 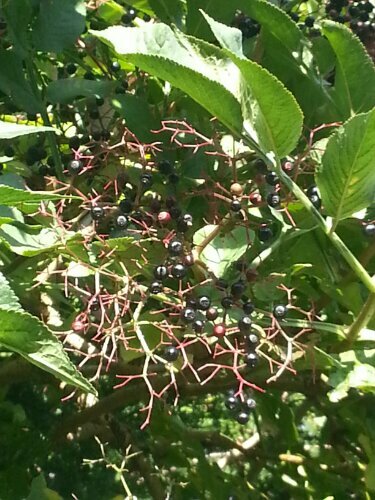 I think I may have to have one last forage for blackberries and elderberries before it grows too cold. 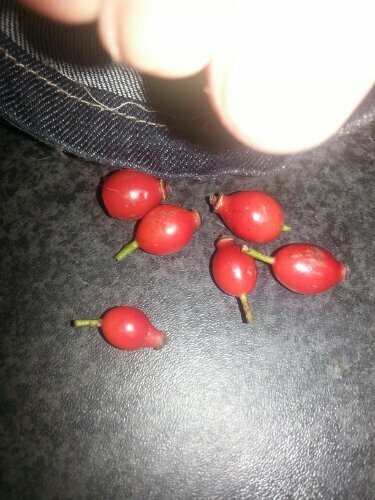 I found some rosehips on my way home to make the syrup- so I gathered about 12 of these. It was my first time tasting these little treats: boy was I surprised at the delicacy they hold! 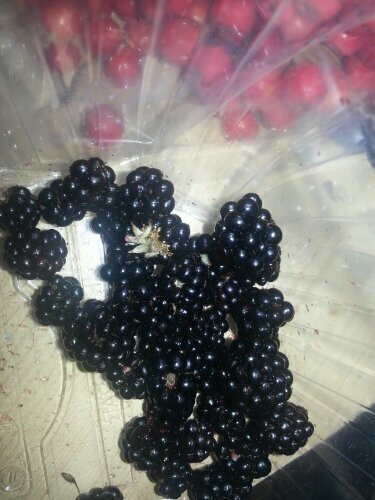 They are also rich in vitamin c.
I used a ratio of 1:3 blackberry and elderberries. I really wanted the elderberry taste in my syrup, but you could do any combination you wish. I froze the berries beforehand as this helps break down the fruit. 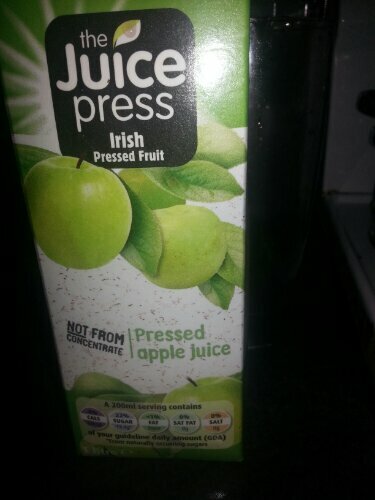 Then I took a teeny amount of not from concentrate apple juice. And poured that on top. 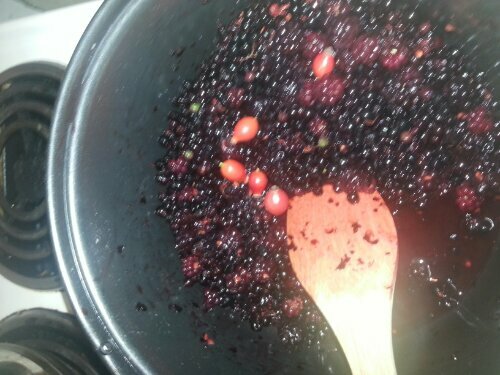 If you have a hand blender use this gently to break up the berries when they are beginning to simmer. Once again, be prepared for the odd stain and juice in your eye.. or maybe I’m just a sloppy chef. 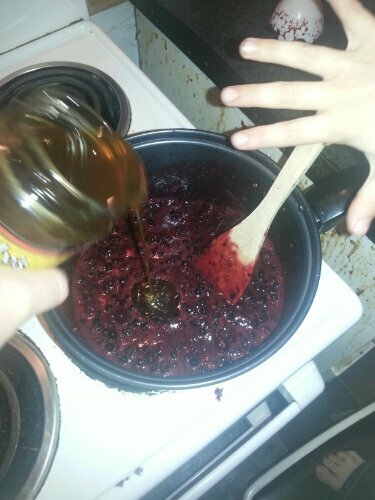 You only want to lightly blend as you dont want the elderberry seeds chopped up too fine- they will impart a bitter taste to the syrup. When a little runny like the picture above, stir and begin adding honey. Work with a little honey at a time, stirring it in quite well. As the mixture begins to boil, dial it back to a simmer. I used mostly organic, local honey for the syrup but as its quite pricey and a treasured cupboard staple- use sugar to thicken it and get the gloopy consistency. I mashed again. Really straining the last I could from the berries and rosehips. 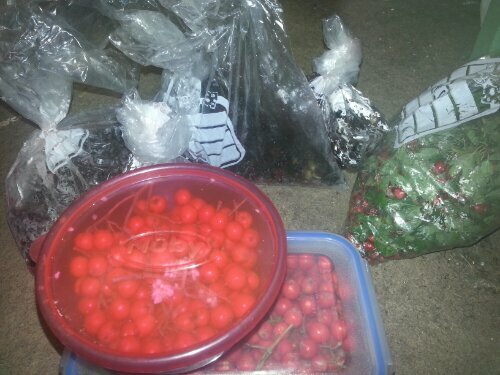 We don’t have a jellybag to strain our mixture through, and the last time I improvised one I found flies in the mix. This time I took and ordinary fine kitchen sieve and strained the mixture through that. 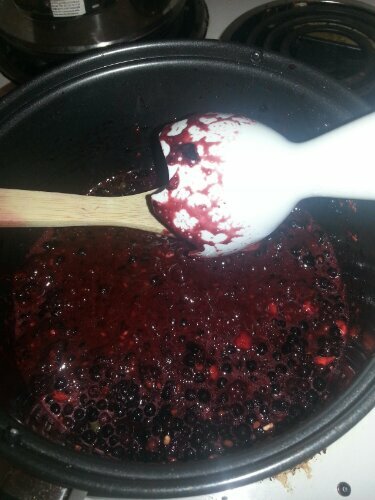 I left the gloopy berries sitting in the sieve above the pot to drip overnight with a lid on top. 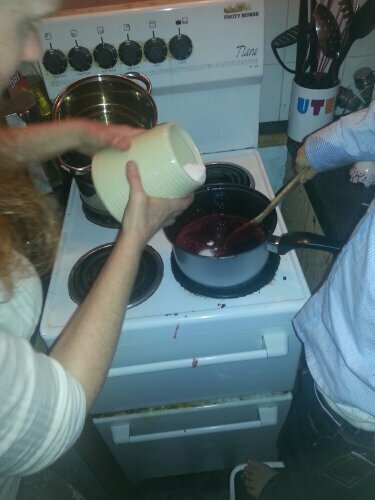 Every so often I pressed the berries with a wooden spoon. 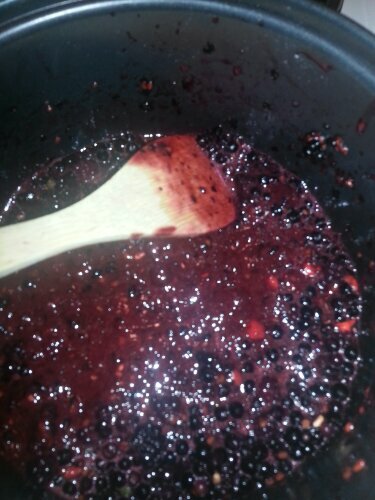 Now, here’s my favourite part; what to do with all that gloopy berry mess? Compost? Feed to your dog? Noooo. Wine, that’s what! 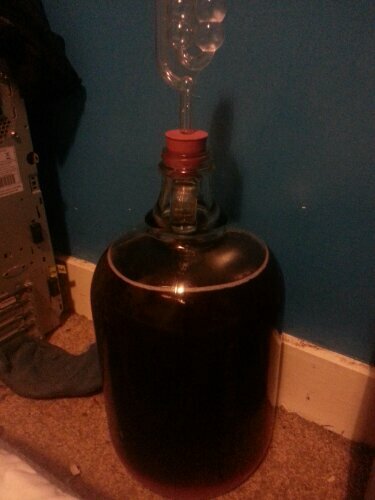 We took the mess and threw it in the demijohn with some extra blackberries. I mixed in a cup of cold tea (for tannin). I kg of caster sugar heated in water and our yeast mixture and yeast nutrient. It looks divine! I’ll have to wait until next year to tell you if syrup leftovers make nice wine. Autumn is in full swing. The leaves are rustling on the ground. Ive always enjoyed the crunching sound of autumn leaves underfoot. We have been very busy this month on foraging trips. 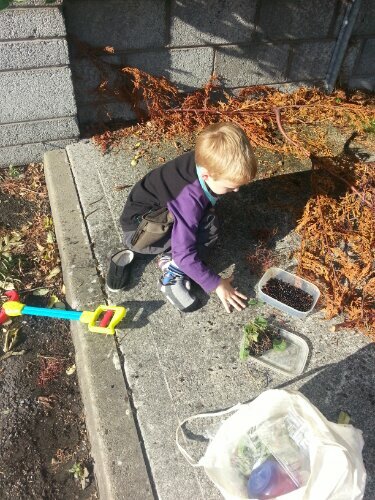 I hadn’t expected my Batman to take so much enjoyment from picking fruits and learning about nature, but he’s hooked! 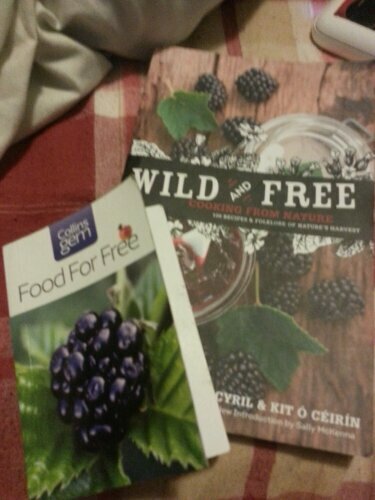 Today he brought me back a berry to look up in our foraging books and identify it. I hope our trips out will make life-long memories. Batman has settled at school, and as little boys do- he tells me very little. I love that his school has no uniform. There are children running in every morning full of colour and joy. I am happy that every child feels free to be themselves. I remember my uniform- it was grey! As I’ve mentioned plenty- I love to craft. I can sew, cross-stitch and knit. Perhaps not very skillfully, but I get there all the same. Last year was my first successful ‘handmade Christmas’ (I had tried and failed 4 years running). Everyone received gifts of bathbombs, shower scrubs ect. Im hoping to add knitting to the list this year. 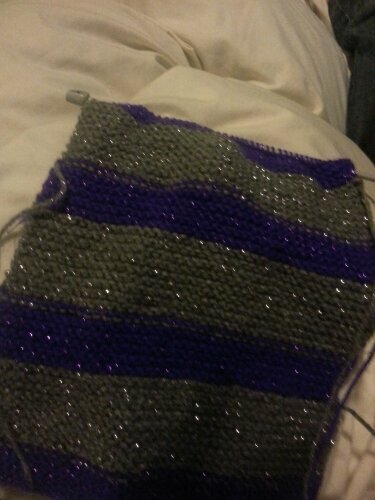 Above is a quick knit scarf Batman has requested. 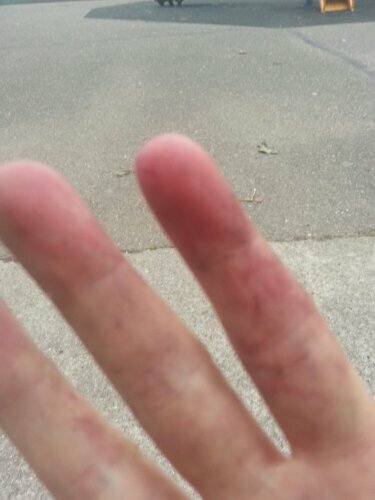 My hands are stained and pricked from blackberries. I have yet to gather enough for wine as we all keep stealing them! There are, however, other edible berries out there for wines. I will try some haw wine (ouch, those thorns hurt!!! 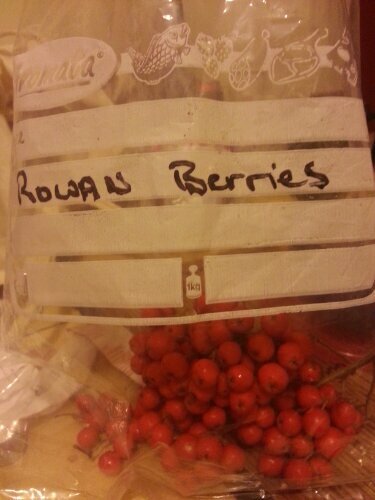 ), and rowanberry wine. Perhaps the blackberries will have to just make a nice liqueur. Its time to get the liqueurs ready for Christmas. I wish the wines would be ready… but the magic is in the patience. We have a few wurzels going which will have been fermented and aged by then. The Joker loves wurzel wine for its speediness. I’m enjoying my last few days of being home before the mad rush of college. 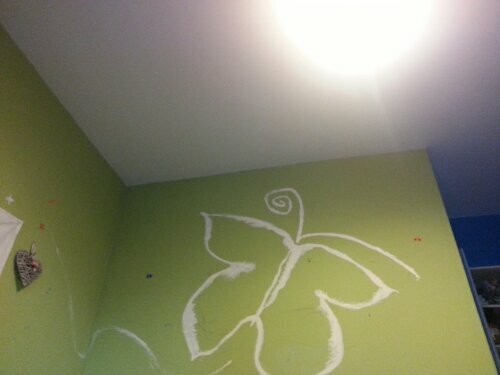 We are still cleaning, clearing and adding some nice touches to our home. It already feels so nice to be within these walls. I’ll say it again; all the stuff you think you can’t live without drags you down. I’ve had little time to prepare our foraged food so its all backed up in the freezer. Tonight I can feel the sniffles coming so I’m using it as an excuse for elderberry syrup. I’ll post of recipes as I go.